Here's a great Valentine's Day gift idea for that special someone! Right now on Amazon you can get this beautiful 2.45 Ct. 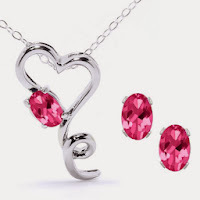 Mystic Pink Topaz Heart Pendant & Earrings Silver Set for only $24.99 shipped!